Please note this new section on flying insects such as the Monarch Butterfly, and Dragonflies, yes, which migrate across Lake Erie. Monarchs have been witnessed by gliders up to 10,000 feet. 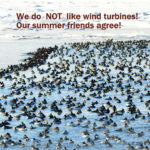 There is no question that they will be impacted by industrial wind in the Lake. We feature this wonderful letter by Suzanne Albright. Images are from Cleveland naturalist and photographer, Kathy Murphy, with thanks for allowing us to post. I have lived in the western Cuyahoga County my whole life. As a young girl I grew up with woods in my backyard. So I’d have to say nature and the natural world has been in my blood since day one. I started my photography passion in 1987 involving nature of course. But for about 7 years I have been totally absorbed and in love with birding. It feels like every time I am out in the field it is a brand new experience. It is also amazing that birds are the window to our planet’s Health and changes. 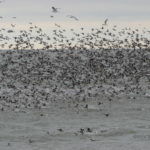 Birds provide us with a strong source of facts to document Environmental changes. 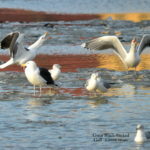 Birds also can provide a lot of fun and exciting entertainment. Also to go birding means you spent some peaceful quality time in beautiful woods, at the lakefront, ponds or swamps. Kathy Murphy. Subject: comments regarding Case# 16-1871 Icebreaker Wind, Inc.
“I was a witness to this big Monarch Butterfly migration this morning coming off of Lake Erie at the western Erie County, PA lakeshore park called Lake Erie Community Park (it is located about 9 miles from the PA and OH border). It is in Girard Township, PA and this part of the lake is considered the central basin which includes the area from Port Clinton, Ohio to Erie, PA.
-Another witness of this Monarch migration was a friend of mine WC who joined me for approx. the last 35 minutes of the observation period that ran from 8:15 am to 10:01 am. Monarchs Over Lake Erie Waters Citizen Scientist Observations, October 14, 2015: …In addition to evidence reported in the Lake Erie islands, there are reports along the OH shoreline further east of the islands and on the water as well. 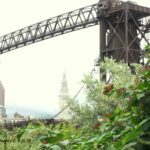 Jen Brumfield, a naturalist with Cleveland Metroparks, reported a large roost of 4000 monarchs gathered at Wendy Park on Whiskey Island on the evening of September 12, 2015. Wendy Park is located directly on the southern shore of Lake Erie near downtown Cleveland, and has long been known by area residents as an annual stopover site for migrating monarchs. Brumfield reported “…After crossing Lake Erie, thousands upon thousands of the dazzling butterflies arrived on Ohio shores to meet a powerful cold front pushing along the lakefront. 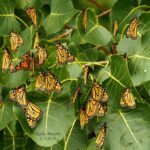 High winds and rain forced an extraordinary number of monarchs to seek shelter from the inclement weather.” Interestingly, monarchs gathered at Wendy Park ahead of the same storm and strong west winds that led to the roost formation on South Bass Island that this author documented that same night. Approximately 4000 monarchs also formed several roosts at the tip of Point Pelee that evening. 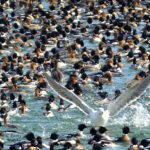 Jen Brumfield often leads boat tours on Lake Erie searching for rare birds. Brumfield reported her monarch observations, explaining “Many, many times I have witnessed monarchs moving over the lake and coming ashore. On the 5th of September 2015, I ran a boat trip off of Port Clinton that covered open water around the Lake Erie islands. I observed 50+ monarchs that day. On September 16, 2015, I counted 250+ monarchs on a 70-mile offshore survey off Vermillion and Huron. The monarchs were anywhere from 5 to 13 miles offshore, and winds were very light from the southwest (virtually no wind). Also from this post: Based on observations by myself and naturalists in the Lake Erie islands, and reports from other citizen scientists in the region, it is clear that monarchs do cross the open waters of Lake Erie. They do so during the summer, as well as in the fall. They are most often seen flying at 20-60 feet above water, but reports of flight altitude range from 8-100 feet above water. 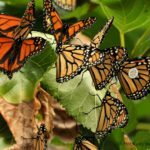 Since most observers cannot see beyond a height of 300 feet above them, it is not clear if monarchs may be migrating over the lake at higher altitudes. Glider pilots have seen monarchs at 10,000 feet, and helicopter pilots servicing oil rigs in the Gulf have seen them at 1000-1200 feet. Are monarchs flying at altitudes over 300 feet above Lake Erie? More evidence is needed. 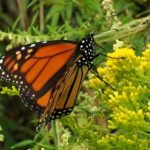 Mark Shieldcastle, Research Director for the Black Swamp Bird Observatory, recently reported seeing monarchs fly onshore from Lake Erie routinely at 100 to 200 meters altitude, along the Magee Marsh beach area on the southern shore of Lake Erie. Additional reports such as this will provide valuable information for understanding the altitude of the monarch migration over Lake Erie. 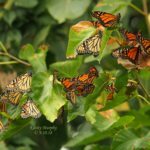 A post shared by Gabe Leidy on 9/08/2018: There are currently ~1000 Monarch butterflies roosting around Wendy Park/Whiskey Island, Cuyahoga Co. These butterflies crossed Lake Erie yesterday on their journey to Mexico, but the current weather conditions have them grounded here. In fact, the USFWS has published information regarding threats to Monarchs that already include deforestation, illegal logging, agricultural expansion, forest fires, and other sources of habitat loss. Are the OPSB and ODNR prepared to give LEEDCo and Fred Olsen permission to cause further risk and death to Monarchs? Where is the research from LEEDCo and Olsen that proves “no harm” to these majestic butterflies as they migrate across Lake Erie? As this project attempts to move forward in the permitting process, it becomes increasingly obvious that the horrific consequences to wildlife and thus the environment that will most likely occur far outweigh any minuscule amount of intermittent, unpredictable energy it might produce. Please, for the sake of innocent wildlife that cannot defend themselves, do not allow this experimental project to be built in Lake Erie.